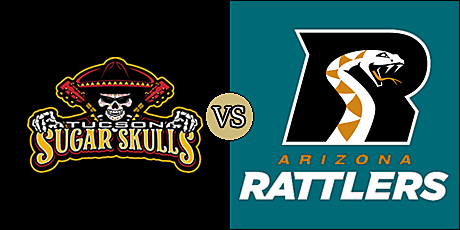 PHOENIX, AZ - The Arizona Rattlers exploded for 28 second-quarter points, and kept on the pressure to defeat the visiting Tucson Sugar Skulls tonight at Talking Stick Resort Arena, 63-28. It was the first-ever meeting between the expansion Sugar Skulls and the Rattlers, who are in their third IFL season after competing 24 years in the Arena Football League. Rattlers head coach, Kevin Guy, and his wife Cathy are the majority owners of the Sugar Skulls. Arizona improved to 3-0 on the season, while Tucson, which suffered its first loss, fell to 1-2. "While the game is going on, it's just another game; I didn't really think about it," Kevin Guy said after the game about coaching against a team of which he is co-owner. "I've got to do what's best for the Rattlers, and Coach (Marcus) Coleman and that team over there is going to get better." The Sugar Skulls got on the board first on Mike Jones' two-yard run with 4:35 left in the first quarter. Verlon Reed, Jr. hit Dezmon Epps for a 26-yard touchdown to draw Arizona even. The teams were knotted at 7-7 at the end of one. Dillon Winfrey's recovery of a blocked field goal try put the Rattlers up 14-7 two minutes into the second quarter. Arizona added a three-yard run from Reed to go up by a pair of touchdowns. The Sugar Skulls cut into that on a 16-yard scamper from quarterback Matt Behrendt. Redd found Markis Sumpter for a 13-yard score, then hit Jabre Lolley on a crossing route for a touchdown with 49 seconds remaining in the first half. The Rattlers led 35-14 at the break. Arizona had the ball first in the second half, and drove eight plays for 45 yards, capped off by a seven-yard run from Reed. Seven minutes later, the Rattlers' other quarterback, Jeff Ziemba rushed in from seven yards and the rout was on with Arizona sporting a 49-14 lead. Jones' 11-yard run made the score 49-23 after three quarters. A pair of touchdown runs by Lolley of 25 and three yards effectively put the game away as the Rattlers held a 63-21 lead with 13 minutes remaining. Tucson added a score on Jarid Brown's 22-yard pass from Jake Medlock with just under five minutes to go in the contest. The Rattlers gained 261 yards of total offense to the Sugar Skulls' 199. The advantage came in the passing game, where the Rattlers had 145 yard to the Sugar Skulls' 82. Each team was flagged seven times; 37 yards for Arizona and 84 for Tucson. The Rattlers' defense forced two turnovers, both being fumbles. Reed went seven of 12 for 121 yards with three touchdowns, and rushed five times for 33 yards with two trips to the end zone. Lolley gained 61 yards on 11 carries with two touchdowns. Lolley also caught two passes for 40 yards and a score. Epps and Sumpter added a touchdown catch apiece. Allen Chapman and Ricky Wyatt, Jr. each recorded 5.5 total tackles, and Chapman added three pass break ups. Chris McAllister and Nikolas D'Avanzo each had a sack, and the latter added a blocked field goal to his line. Like the Rattlers, the Sugar Skulls utilized both their quarterbacks. Matt Behrendt started the game, going six of 14 for 37 yards, while rushing 11 times for 40 yards and a score. Medlock completed six of 12 passes for 56 yards and a touchdown. Jones gained 63 yards on nine rushes and two touchdowns. Donovan Rasberry caught five passes for 37 yards, and Brown had two grabs for 26 yards and a touchdown. Zach Allen led the way for the Tucson defense with 11 total tackles. Each of these teams have byes in week 5 with each returning in week 6 for Sunday matinée games. The Rattlers will host the Sioux Falls Storm on March 31 with kickoff set for 3:05 p.m. pacific (5:05 p.m. central). The Sugar Skulls will be at home against the San Diego Strike Force. Kickoff in that one is also scheduled for 3:05 p.m. pacific (5:05 p.m. central). The Storm are in neighboring North Dakota to face the Bismarck Bucks on March 16 with kickoff scheduled for 4:05 p.m. pacific (6:05 p.m. central). After a bye next week, the Danger return to action in week 5 when they host the defending champion Iowa Barnstormers on March 23. Kickoff in that one is set for 5:05 p.m. pacific (7:05 p.m. central).